By pressing the Web Savings "SAVE" Button you have discovered a savings. Thank you for visiting our site and searching for great optical products and services. Our goal is to help you look great, see your best and "save you money" without compromise. 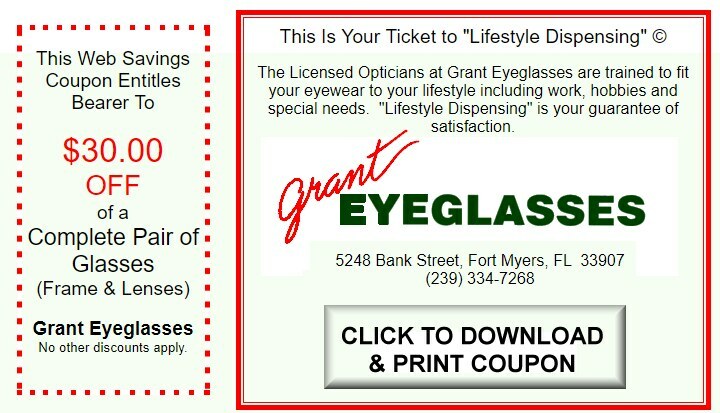 Print your ticket to "Lifestyle Dispensing" or say the secret password "EAGLEVISION" when you place your order and save $30.00 on the purchase of a complete pair of eyeglasses (lenses and frames) without compromise in quality of product or service. Service is our #1 product. Don't get caught in the wild! Come to Grant EYEGLASSES for civilized eyecare you can trust since 1967.